Leeds Beckett University has teamed up with Burley and Woodhead Church of England Primary School in West Yorkshire and Alive and Kicking Theatre Company to investigate creative ways of increasing children’s motivation for writing. Dr Tom Dobson, Principal Lecturer in the Carnegie School of Education and project leader, explained: “National curriculum changes in England, and the accompanying testing of technical aspects of writing, have created a situation where the teaching of writing is at risk of becoming very one-way and instructive, and less engaging, for children. The project begins this month for seven months and is funded by the United Kingdom Literary Association (UKLA). It is led by Dr Dobson, Lisa Stephenson and Ruth Sutcliffe at the Carnegie School of Education at Leeds Beckett. Teachers at Burley and Woodhead Church of England Primary School in Burley-in-Wharfedale, West Yorkshire, will be trained by Alive and Kicking and Leeds Beckett researchers to use drama and to adopt the identity of a writer when teaching writing to their classes. At a time when government testing of spelling, punctuation and grammar can lead to less creativity in the teaching of writing, the project provides compelling alternative approaches for schools and their teachers which will engage children and give them a strong investment in their writing, whilst also being able to satisfy curriculum demands and statutory testing. 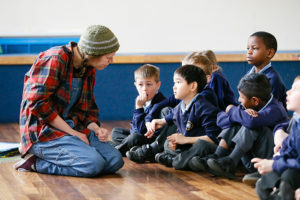 John Mee, Associate Director at Alive and Kicking Theatre Company, said: “We will go into the classroom with the structure of a story – a setting, a time and place – and offer opportunities for the children to build the piece – who are the characters, and why are they there? This gives the children lines of enquiry and encourages them to lead the process. Andrew Wilkinson, Deputy Head of Burley and Woodhead Church of England Primary School, said: “It is important that we continually inspire and excite the children we teach and continue to provide them with opportunities to express their creativity. 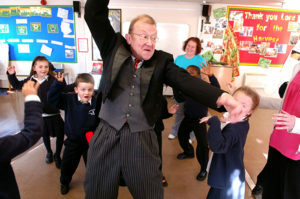 At our school we know how valuable drama is for inspiring and motivating children with their writing. It is also a powerful tool to enable children to investigate and explore their ideas, as well as for addressing social and emotional aspects of learning. I am keen to help our teachers to develop their understanding of how drama can help children. “The pupils are going to absolutely love the sessions. Working through drama allows children to immerse themselves in a story so that they know it and own it. Being involved in story-making in this way gives children the space to play around with and develop their ideas. It will deepen their engagement and strengthen their motivation for writing.